Back in late 2013, I had the misfortune of covering this gem, back on episode #9 of the Quarter-Bin Podcast. I recently discovered a blog that has been operating since the start of 2015, which also has the mandate of covering cheap comic books, The Crapbox of Son of Cthulhu. Well, poor Michael Carlyle also had the misfortune of covering this same book. If you are interested in another person's take on this issue, check out his blog post on the issue. Spoiler: we don't disagree all that much. "As the Silver Fog Rolls in"
All stories written by Marv Wolfman, with art by Carmine Infantino, Dennis Jensen, and Larry Mahlstedt. What did Professor Alan find that one time he dialed "Q" for Quarter-bin? Did these stories dial "A" for Awesome? Or "Z" for Zero? Listen to the episode and find out! ﻿﻿﻿﻿Next Episode: Freex #2, Malibu Ultraverse, cover-dated August 1993. 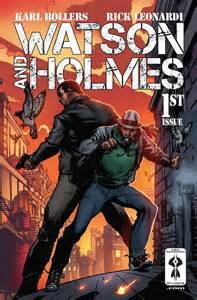 Watson & Holmes #1, New Paradigm Studio, cover-dated July 2013. ''No time for explanation, the game's afoot!" by Karl Bollers, with art by Rick Leonardi. What happens when Sherlock Holmes is re-imagined as a young man in modern-day Harlem? What do Professor Alan and special guest Ron Sadowski think of the concept, and how that concept is executed? Listen to the episode and find out! Link: Dinner 4 Geeks podcast, featuring Ron Sadowski. ﻿﻿﻿﻿Next Episode: Adventure Comics #479, DC Comics, cover-dated March 1981.